As a street facing retail space the new Subiaco Telstra store needed to be as exciting as the products it sells. That’s why they engaged our team at Perth Citi Fitout for the second time to make that happen. Built into the newly developed Subiaco shopping precinct just off Subiaco Square this 80m2 showroom needed to be transformed from a brand new, never before used space into a branded hub of technology. The designs were incredible and had been completed by CARA, Telstra’s Australia wide design company and were the perfect blueprint for this high spec fitout. At the time of our fitout installation the building itself was still a construction site so we had to negotiate and navigate our work around the countless other trades working throughout the building. Since we had worked with Telstra before on their previous Subiaco space we had a strong relationship and understanding of expectations. The mechanical components, as these were provided off-site. 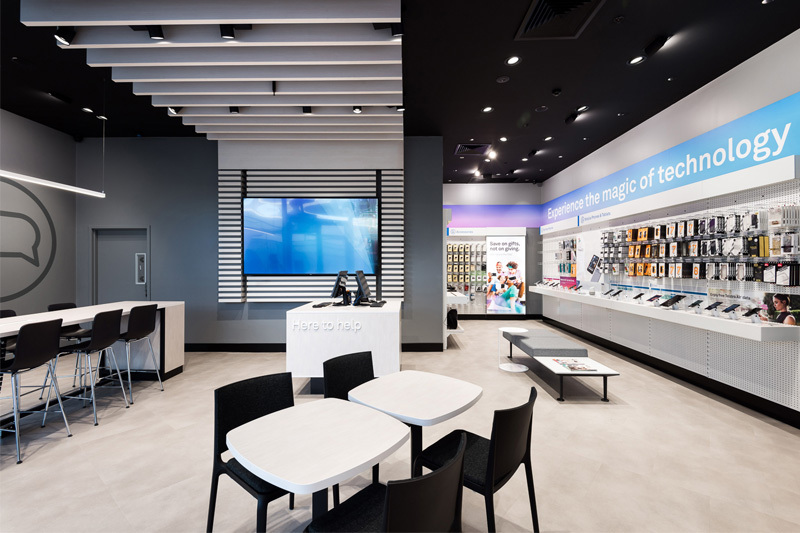 This project is a resounding success for both Perth Citi Fitout and the Subiaco Telstra store because of its quick 4 week turnaround time that did not sacrifice the quality and finish of the project.